Jonah Mandelbaum, MJJ Builders Corp./Warwick Properties Inc.
State and local officials joined Jonah Mandelbaum, The Community Preservation Corp., Inc. (CPC), Independent Home Care, Inc., Independent Living, Inc., New York State Homes and Community Renewal (HCR), the New York State Office for People with Developmental Disabilities (OPWDD), and local officials to celebrate the groundbreaking of Independence Sq., a new affordable housing complex. Located at 11 Washington Sq., Independence Sq. will provide workforce housing for working families and supportive housing for individuals with disabilities. Support services will be provided by Independent Living and subsidized by OPWDD. "This region has benefitted tremendously from successful public-private partnerships, and I thank CPC, Independent Living, HCR, and all involved partners for supporting our efforts to create new homes that will keep hardworking families in their local communities," said Mandelbaum, president, MJJ Builders Corp./Warwick Properties Inc. "I am excited to break ground and look forward to meeting with all of the project partners again to celebrate the successful completion of Independence Sq." "This development is a unique opportunity for public and private partners to come together to create high-quality affordable housing for two groups in critical needâ€”hardworking individuals like schoolteachers, nurses, and police officers and their families, and people in the supportive housing community who want to live independently with services," said Doug Olcott, Senior Vice President, Director of CPC's Hudson Valley Region. "CPC is thankful to our partners at Independent Living, all of the partnering entities and, of course, our long-time borrower, Jonah Mandelbaum, for helping us to continue our mission to stabilize neighborhoods through the creation of affordable housing." "Residents of this new affordable development will have access to convenient public transportation, new community amenities, and vital supportive services to assist those with disabilities in making their own choices," said Doug Hovey, President and CEO, IL Strategy Group, Inc., Independent Home Care, Inc. & Independent Living, Inc. "Independent Living has been serving our local community with excellent supportive services since 1987, and we look forward to working with great partners like CPC, OPWDD, HCR, and Jonah Mandelbaum." The three-story, 74-unit apartment complex will consist of 38 one-bedroom units, 30 two-bedrooms, and six three-bedrooms, including a three-bedroom unit for the superintendent. In addition to supportive services, the development will also include 70 on-site parking spaces, laundry facilities, and community space. The 60 workforce housing units are affordable to households from 30% to 60% of the area median income (AMI). The one-bedroom apartments will have restricted monthly rents at $395 and $715, the two-bedrooms at $475 and $860, and the three-bedrooms at $545 and $995. The remaining 14 supportive housing units will be eligible for rental subsidies provided through OPWDD. "Independence Square will be a wonderful addition to the City of Newburgh. A complex that combines affordable housing for hardworking families and supportive housing for individuals with disabilities is an asset to the community and I applaud everyone involved for making this much needed project a reality," said State Senator Bill Larkin. Darryl C. Towns, Commissioner/CEO of HCR said, "Independence Square is a wonderful example of community, government, and the private sector coming together to expand the availability of affordable housing. Governor Andrew Cuomo has made access to safe, quality housing a priority so that families have a brighter future, more people can live independent, productive livesâ€”and the entire State can benefit. Congratulations to Warwick properties, Orange County, and to Mid-Hudson residents who will live and thrive at Independence Square." "I have been in favor of this project since the beginning," said Mayor Judy Kennedy. "It is in the right place at the right time. In addition to providing housing and supportive assistance for individuals with disabilities, Independence Square will address the need for affordable housing for working families. This project, which is close to transportation, shopping, and more, will also be a great way for those who live here to become a part of the community." A diverse group of public and private partners came together to finance Independence Square. CPC provided an $8.9 million construction loan and is slated to provide a $2.1 million permanent loan through the New York City Employee Retirement System (NYCERS) with 100% SONYMA insurance. HCR provided a $1.425 million annual allocation of Low Income Housing Tax Credits which generated $13.892 million in private equity. Raymond James Tax Credit Funds, Inc. syndicated the tax credits, and TD Bank provided the tax credit equity. HCR also provided a $725,000 Housing Trust Fund loan. Orange County provided a $170,000 loan through its HOME Program. "Families who live and work in the community will benefit tremendously from this latest public-private partnership. This project will add housing opportunities to Newburgh's workforce and provide independence and dignity to those with disabilities. 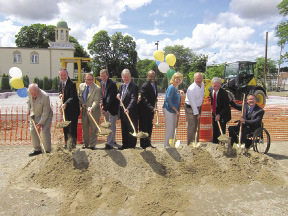 I am pleased to partner with Jonah Mandelbaum, Mayor Kennedy, CPC, Independent Living, HCR, OPWDD, and others to announce Independence Square's groundbreaking, and I look forward to joining together again as we continue to move Newburgh and Orange County forward," said Orange County Executive Steve Neuhaus. "On behalf of the Office for People with Developmental Disabilities (OPWDD) and Acting Commissioner Kerry Delaney, I would like to thank each of the partners that made this day a reality. The public/private partnership demonstrated between Jonah Mandelbaum, The Community Preservation Corporation (CPC), Independent Living, Inc., the New York State Housing and Community Renewal (HCR) office and OPWDD demonstrates a model for the future in meeting the needs for supportive housing. OPWDD is excited to have 14 units which have been set aside for people with developmental disabilities who would like to live within the community of their choice with the appropriate supports and services. We see this as a model for the future to allow those with intellectual and developmental disabilities to be integrated into the community of their choice and achieve the dreams and goals that they and their circles of support have for them," said Gerald Huber, Deputy Commissioner, Division of Person Centered Supports, NYS Office for People with Developmental Disabilities. Darryl Seavey, Managing Director Northeast Region of Raymond James Tax Credit Funds, Inc., said, "Raymond James is thrilled to participate with the project developer MJJ Builders Corp in the development of Independence Square. This project will bring first rate independent supportive housing opportunities to area residents. Independence Square will be an asset to the City of Newburgh and will provide quality affordable housing to deserving members of the community for many years. Raymond James would like to congratulate Jonah Mandelbaum, a leading affordable housing developer, on the start of this fabulous new project as well as all of the participants who made this project a reality. I would especially like to thank The Community Preservation Corporation and TD Bank, both of whom worked with Raymond James on project financing." Photo Caption: Shown (from left) are: William Larkin, Jr., New York State senator; Gerald Huber, acting deputy commissioner, Division of Person-Centered Supports, NYS Office for People with Developmental Disabilities; Rich Mayfield, director Orange County Community Development; Doug Olcott, senior vice president & Hudson Valley regional director, The Community Preservation Corp.; Harry Porr, office of the County Executive, Orange County; Darryl Towns, commissioner/CEO, NYS Division of Homes and Community Renewal (HCR); Hon. Judy Kennedy, mayor, city of Newburgh; Mandelbaum; John Ebert, rehabilitation specialist, Orange County Office of Community Development. ; Douglas Hovey, president/CEO, Independent Home Care, Inc., IL Strategy Group, Inc. & Independent Living, Inc.